Even if you weren’t there, or watching it on television, even if you weren’t born on the 30th July 1966, it’s a date etched on the heart of every England football fan. It’s the day England, at Wembley, after progressing through a tournament full of controversy, excitement and some extraordinary upsets, won the World Cup. Inside the stadium were almost 94,000 fans. On television, the audience was 400 million. Watching it now, it seems somehow more than four decades away. It’s not just the grainy black and white film – it’s the cropped hair and short shorts of the players, the lack of logos on the England shirts – just three heraldic lions; it’s also the measured, understated commentary of Kenneth Wolstenholme, all on his own throughout the match. The goals, when they came, produced little jumping about and no hysteria – it was more a case of a rather satisfied jig. When Bobby Moore took the trophy from the Queen and held it up for the crowd to see, he didn’t forget to wipe his hands first. 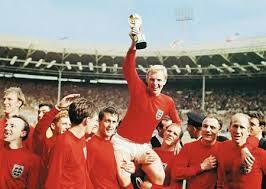 It was, without doubt, England’s greatest sporting victory. In this episode of The Reunion, originally transmitted in 2006, Sue MacGregor gathers five men – three of them players – who made that day so extraordinary. Hat-trick goal scorer Sir Geoff Hurst, and his fellow West Ham player Martin Peters; George Cohen, known as Mr. Dependable, who played for Fulham; the man in charge of BBC television’s coverage of the match, Alan Weeks; and one of the all important admin men – the team liaison manager for the London matches throughout the tournament, Alan Leather.